Goblin Legion HD is a FREE iPad application developed by Guangxi Nanning Qiwang Computer Ltd. It is a RTS game similar to Command and Conquer and Civilization. 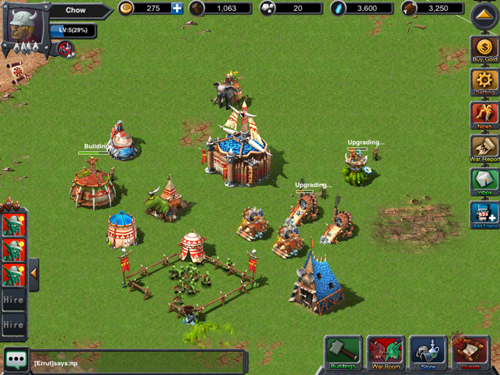 The object of the game is to build up your empire and attack and defend against other online players. The graphics, animations, and artwork are very well done. This game will definitely keep you occupied for hours as there is so much you can do. You get to build all sorts of buildings to create your custom empire. Once you are satisfied with your empire and its defense you can move on an attack other players and try and steal some of their resources. The controls are very simple and the more you play the game the easier it gets. You will understand what you need to build and what you need to upgrade to advance your rank. This game is an Online game only. That means you have to be connected to the internet to play. Although the game is FREE you are going to want to buy gold which can be used to speed up the game, otherwise you will be just waiting for things to build and upgrade. Overall the game is very well done and fun to play. The waiting game gets you to keep coming back to the game and leveling up. There are a few bugs in the game and the developer has already improved it a ton. You may notice a few crashes, but your game will automatically be saved since everything is online. Go check out Goblin Legion HD for the iPad on the Apple App Store.